Test measures nonverbal fluency, understood as an ability to create new patterns in limited time. DESCRIPTION: RFFT consists of 5 parts – charts. Each chart contains a grid of 35 squares with defined set of dots and distracting stimuli. The task is to draw as many unique designs as possible by connecting with a straight line at least two dots in each square. Each test part has to be completed within 60 seconds. Individual parts are preceded by example tasks. RELIABILITY: Polish standardization proves stability and congruent reliability. VALIDITY: Proved correlations with measures of cognitive functions, confirmed concurrent validity via intergroup comparison method – including persons with brain damage of various location and etiology. 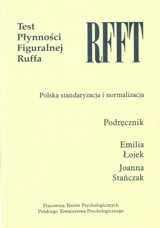 NORMS: For persons aged 16-79 (all-Poland sample).